NOTE: This article has been updated with *new information as of 5:00pm EST. I rarely watch the news anymore and find that I’m happier because there is way too much questionable “news” content these days, which is more often than not, someone’s commentary or opinion disguised as news (factual information), who has an ax to grind. It’s simply not worth my time. Anything I need to know can be researched on the ‘Net and verified (or not), through a multiplicity of sources. This is absolutely tragic to say the least. It is natural to feel a deep sense of pain, loss, and even hopelessness because of situations like this. On one hand, our hearts go out to those directly affected by this tragedy and on the other hand, we feel helpless in being able to do anything of substance that would actually help the situation. We can only wonder how this can happen? The shooter’s brother was apparently stunned to learn that his own brother was responsible for the mayhem. He indicated that he knew his brother had a few handguns and possibly one long rifle, but it is clear from video taken by people at the scene while the shooting was happening that the shooter had fully automatic weapons in his possession and was using them to massacre people. The brother was at a loss to understand. So are the rest of us. Police recovered numerous long rifles from the suspect’s hotel room and his home in Mesquite, NV after the shooting. Police have indicated that the shooter – 64-year-old Stephen Paddock – had no military background and has no criminal record other than a minor offense. Police have denied that ISIS was behind the tragedy or that the shooting is connected to some overseas or domestic terrorist organization, even though ISIS have claimed responsibility, saying the shooter had recently converted to Islam and was one of their soldiers. ISIS has claimed responsibility for numerous terrorist tragedies involving concerts in various places in Europe. “While the suspect wasn’t familiar to authorities, his name should be. 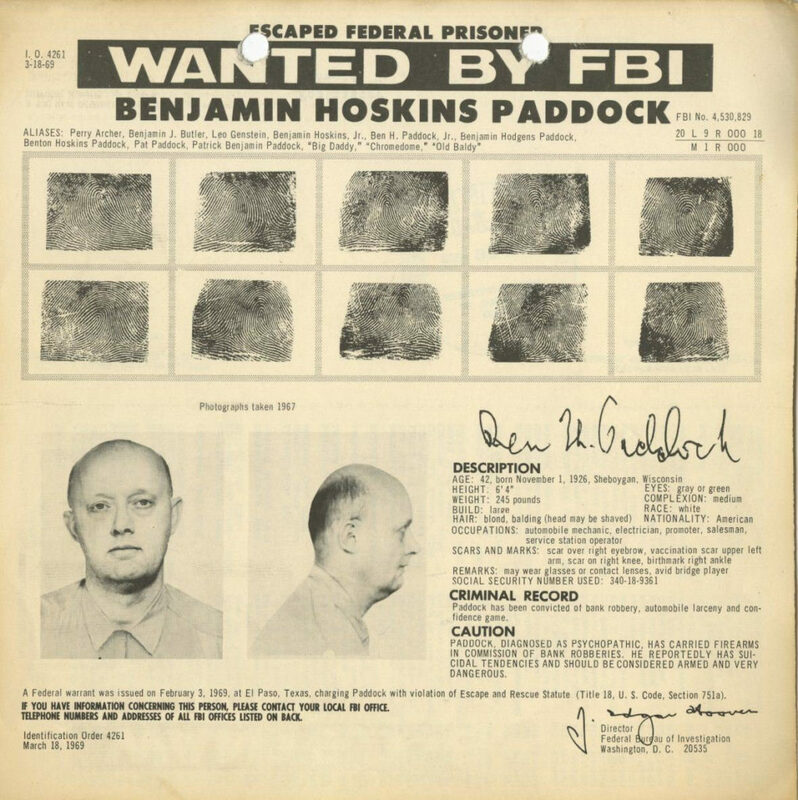 The suspect’s brother told ABC’s Tampa affiliate WFTS that their estranged father, Benjamin Hoskins Paddock, was a notorious bank robber who spent several years on the FBI’s ‘Ten Most Wanted Fugitive’ list. Apparently, the father was a true psychopath. There will undoubtedly be renewed calls for tougher gun control laws, but the laws that exist currently may have preempted Paddock from owning a fully automatic weapon. In essence, no new laws would have prevented this tragedy, but lawmakers will rise to the occasion and play the role of deeply concerned individuals, riding the rising tide of emotional virtue to bring about new laws that will not change anything, but simply give people a false sense of security. Police officials in Las Vegas have stated that there was no way this tragedy could have been prevented. The gunman himself brought in his cache of weapons to his hotel room. How he was able to obtain them is still the question. What politicians and anti-gunners in general will never admit to or realize is the fact that no amount of anti-gun laws will make society safer overall. The reason? Murderers and psychopaths live among us. Criminals who cannot pass a background check already buy guns on the street. They’ll continue to do so. They ignore the laws, they circumvent them to get what they want and nothing will change that. We’re not yet sure how Paddock managed to obtain automatic weapons, but they are extremely difficult to purchase and own. The government has extremely strict rules for purchasing and owning automatic weapons and the wait time before approval can be anywhere from six months to one year. It is possible that he somehow managed to convert his long rifles into automatic weapons. We’ll have to wait and see what authorities learn. 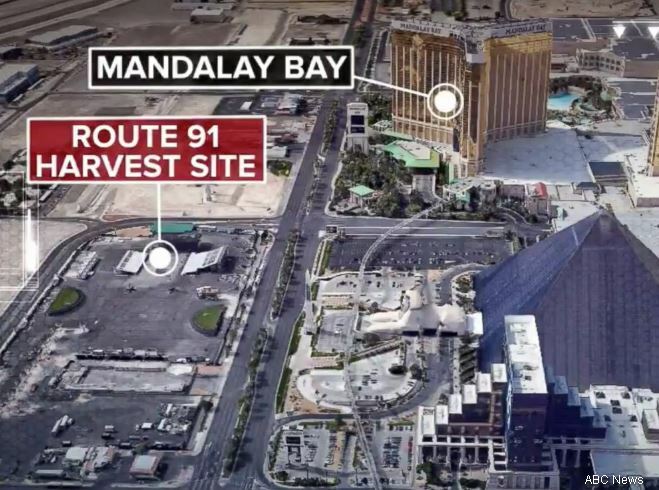 In the videos, several long bursts of automatic weapons fire can be heard, separated with short periods of silence, where Paddock may have been reloading or taking up another weapon already loaded. The weapons used were without doubt *fully automatic as no one can pull the trigger that quickly. But of course, there is a much larger issue at stake here and it has nothing to do with anti-gun laws or even eventual gun confiscation. The issue has to do with this one question: where will you spend eternity? Each of us come into this life with a certain amount of time allotted to us. We will live out that time and then die (which again proves God’s sovereignty over us), with our souls going into eternity, as our bodies go back into dust. Whether we are killed in a car accident, due to a heart attack or other health issue, or shot down unmercifully by some crazed madman at a concert all results in the exact same thing – death. It is very clear from Scripture that God is completely sovereign, though many refuse to acknowledge it. Their first question – where is God in this tragedy? – effusively flows from their lips almost the instant something terrible like this happens and it is often posed as a statement of blame rather than a sincere question wanting an answer. These folks really don’t want the answer because the answer points the finger right back at them and all of humanity. Sin and death are in this world – God’s Creation – because of humanity. Had not our first parents embraced the path that opposed God, sin never would have darkened the doorway of earth. Had sin never been allowed to enter, death would not have followed as the result. The results of sin leading to death gaining entrance and precedence to all the earth were absolutely disastrous and catastrophic as we learn in Genesis 6:5, with the events leading up to the Great Flood. What started out as idyllic in Eden, spiraled down into a morass of sin, pain, evil, and death only a few chapters later in Genesis. It may be difficult for us to imagine a society where the everyone continually thought about and entertained evil exclusively. Unfortunately, we may be very close to that ancient time once again. Consider a society in which everyone did what was right in his/her own eyes. They thought nothing about the effects of their actions on others. Instead, their gratification, their wants and desires were all they cared about. It was all about them. They see a car they like? Steal it. They see a woman they want to ravish? Do it. You have something they want? They take it. You get in their way? They deal with you. Is it far-fetched to think that this is what society is becoming? Yet people mistakenly believe that “peace” will be achieved if we simply eliminate guns. In this one sentence from Genesis (“the beginnings” of humankind’s timeline), we learn exactly how corrupt the people of the earth were at that time, all except Noah. Noah, described as a preacher of righteousness according to Peter, was the only one God chose to save (and Noah’s immediate family). Commentators disagree over what the term “preacher of righteousness” means. Some say Noah actually preached to those around him about the upcoming flood, while others believe his life stood out and separate as righteous. I tend to favor this latter view because it seems clear that God chose to save only Noah and his immediate family. All others were clearly unsalvageable, with God wanting to start over with Noah. But try to imagine a society where everyone is completely involved in thinking only about what is best for themselves and it doesn’t matter how they make things happen for themselves. Laws mean nothing. It’s all about “every imagination of the thoughts of his heart” being “evil continually.” There was a time when that element in society was in the minority, not the majority, but that is certainly changing. People have become far more inconsiderate and concerned only about their own needs and wants. Selfishness is too often the norm today. What is it that motivated the shooter to use automatic weapons to open fire on people simply attending a country-western concert? At this point, no one knows and we may never truly know what the triggering event was for him. God certainly knew and yes, He allowed it. Why? Because God doesn’t automatically overrule each person’s sinful tendencies (free will to choose). If He did, there would be no sin in this world and there would also be no free will either. God is pained when these things happen, even though He knows before hand that they are going to occur. This does not make God culpable because of man’s free will. Man and man alone is responsible for his actions. The shooter in this most recent tragedy locked himself in his hotel room on the 32nd floor, overlooking the concert venue. It was from there that he took aim at the 22,000 people and began randomly firing into the crowd. Paddock is now eternity facing God for his life decisions while he lived and is giving a full account of why he did what he did and not just for last night’s actions, but for the entirety of his life. Folks, no one will get out of this life alive (excepting the Rapture). We will all pass through the door of death to stand before Almighty God and will give an account for our life, our words, and the decisions we made while we lived here. The people who honestly believe that more gun control laws would have effectively kept Paddock from doing what he did are completely missing the point. Roughly 150,000 died yesterday and 58 of them died because of Paddock’s murderous actions. The other 149,942 died from other things, but they all died nonetheless. This is not to sound heartless. It’s to simply point out the truth that none of us knows the day, the hour, the moment, or the method of our upcoming death. Yet, that date with death looms. We all have a date with God that He Himself set. We need to receive salvation now, while we are on this side of eternity. We do so by entering into a relationship with the Living Jesus, who came, lived a perfectly sinless life, died for us and bore our sins though He Himself had never personally sinned (2 Corinthians 5:21). I wonder how many who died last night in Las Vegas knew the Savior? I hope all did, but for those who did not, it is too late. Their chances to receive salvation are over but yours are not. Will you acknowledge that you are a sinner? Will you admit that you have at some point broken God’s Laws, making you culpable, putting you at enmity with God (Colossians 1:21), and making your sin punishable with eternal separation from Him? There is a remedy for that and it has been graciously and lovingly provided by Jesus, God the Son, who gave Himself for you and me that we might have eternal life. It is not a decision to be made lightly. It is not a “get of hell” free card. It is a decision that on one hand receives salvation because on the other hand, it enters us into a living, viable relationship with Jesus, who becomes our Savior, and Lord (literally, Owner). Salvation cannot be earned (Ephesians 2:8-10). It cannot be purchased because it has already been purchased for us by Christ Himself. I pray that God will open your eyes to the truth and reality that salvation can be yours if you will kneel at the foot of the cross so to speak, confess the fact that you are a sinner (you’ve broken God’s Laws), and you are in need of a Savior. Through your faith, He extends welcoming arms to you and will grant you the salvation that you need. Would you come to Him today? Would you stop putting off what you should have taken care of yesterday? Entry filed under: Atheism and religion, Cultural Marxism, Demonic, devil worship, Emotional virtue, eternity, Gun Control, ISIS, Life in America, Political Correctness, Politically Correct, Politics, Radical Islam, rapture, Religious - Christian - End Times, Religious - Christian - Prophecy, Religious - Christian - Theology, salvation, Satanism, second coming. Tags: death, eric paddock, eternity, las vegas shooter, mandalay bay, route 91 concert, route 91 harvest site, salvation, stephen paddock. Thank you. May the Lord be glorified.